The villa is located in the municipality of Castelfranco above 15 minutes from the A1 exit of Incisa Valdarno located in the center of a property of about 5 hectares of olive trees and surrounded by woods: it is the ideal place to spend days immersed in the quiet, close contact with nature. The apartment in the villa, on the first floor, is independent and consists of two double bedrooms, one single bedroom with possibility of extra bed, living room, kitchen, two bathrooms and large covered terrace. The remaining portion of the villa is inhabited by the owners 4/5 days a week, for the necessary maintenance of the garden and the pool and always available for any need. The property is surrounded by a large enclosed garden with internal parking, on the ground floor a games room with a game table, billiards and table tennis, outside a barbecue placed at the edge of a pool for the exclusive use of m. 12x6, is equipped with free wifi and satellite TV. In the summer the night the temperatures are maintained to low levels being the property situated to approximately 350 ms. above sea level. Recently renovated, the house maintains the characteristics of the Tuscan countryside with wooden floors and wooden wrought iron beds while maintaining a modern look in the kitchen and bathroom facilities. The kitchen is equipped (fridge, oven, dishwasher, various utensils, etc.) and the equipment allows you to organize lunches and dinners. The weekly rental includes the supply of all linen, both for the rooms and for the bathrooms and with bathrobes for the pool. The location is ideal for those who love the comforts of the Tuscan countryside but want to visit the cities of art: Florence and Arezzo are conveniently reachable in less than an hour either by car or by train from Figline Valdarno while Siena is an hour's drive away . In the surroundings you can visit some Romanesque churches. For the daily shopping in addition to the shops in the neighboring countries at 2/3 km only 7 minutes drive there is a large Coop hypermarket. We have just arrived back from a 2 week stay in Italy, 1 of the weeks we spent in this fantastic villa. The owner Valter and his wife were so warm and friendly and the welcome gifts they gave us on arrival were a very thoughtful touch. They live in the downstairs of the villa and whilst they were there most of the time they did not intrude on our holiday at all. The gardens are beautifully kept with comfortable patio areas, a games room and of course that wonderful pool! With temperatures reaching 40+ during our stay the large pool was a godsend and I don't know how we would've managed without it. The villa itself is extremely well equipped, we wanted for nothing (apart from air conditioning during the unusually high temperatures) and the large veranda was ideal for relaxing in the shade and for eating our meals. We would highly recommend this villa, so relaxing in a beautiful setting. Claire M.Skipton, North Yorkshire, UK. Just home from two wonderful weeks at Villa Barbalena...missing it already! 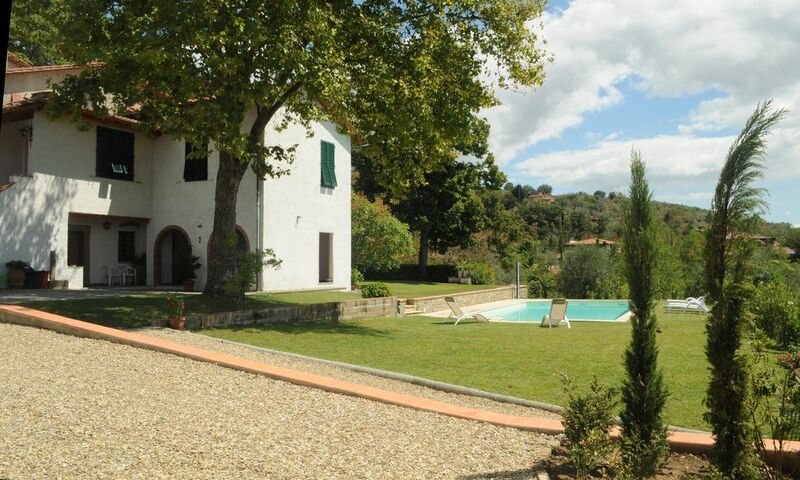 The property is in a lovely rural setting & is perfectly located to explore Tuscany (eg. Pisa 1.5hrs away, Florence 45mins & Siena 1hr). Exploring the little hilltop towns such as San Gimignano & Cortona were a particular highlight. Lucca is also definitely worth a visit! The property itself is fabulous, with pretty much everything you could ask for, including hairdryers, a dishwasher & a huge fridge to keep all your drinks cold :) there is no kettle though, just a metal jug that you heat on the stove (but we really didn't see it as a problem & it was usually too hot to want a warm drink, but may have been useful when cooking). The villa was comfortable & of an extremely high standard. The pool was amazing & a late afternoon dip was perfect after a long hot day of exploration! No shade when you're in the pool, so being fair-skinned like me meant early morning or late afternoon was the perfect time to swim without getting frazzled! There's a little patio area with sunbeds & seating on the ground floor near the pool where you get a nice breeze...it's sooo relaxing there! The owners were very nice & helpful too, we had some unexpected welcome gifts on arrival which was a lovely touch. The only slight downside to our holiday were all the mosquitos/bitey bugs, i've been badly bitten non-stop despite using bug repellant. But that is not the property or the owners fault & would not put me off going back...I'd just make sure i had the best repellant i could get! Overall i cannot fault Villa Barbalena, we had a wonderful 2 weeks & wish it had lasted longer. I would definitely recommend & would love to go back in the future. I thank you for mentioning the lack of the kettle and we have already made the purchase, if you told me I would have bought it before. The apartment is superbly appointed with all the things you need to make a stay in this beautiful part of Tuscany perfect. 2 large bedrooms with very comfy beds 1 smaller room with single bed, 2 bathrooms with great showers. A well-equipped kitchen with dining table, lounge with TV etc and a balcony with views over the Tuscan hills. Sat there with a glass of Prosecco and some antipasti was a really pleasure and one which will stay with me. The pool is the worth a special mention, crisp clear water, immaculately kept and again with those views. The owners were lovely, really keen we had a good time and we did, they were really helpful with advice on the local area and where to go. Towns around, Florence 45 mins is stunning, that dome! Sienna about an hour is beautiful, lovely shops and stunning medieval architecture. Pisa, 1.5 hours good to see the tower but we found that was about it. In short, we can’t wait for the next time we go to Tuscany and we would love to stay here again. I proprietari, Valter e Patrizia, sono molto simpatici a hanno fatto tutto per darci una bella vacanza. Ci hanno addiritura dato il benvenuto con una bottiglia di prosecco, vino e oglio, e una torta deliziosa! Insomma, la Villa Barbalena è un posto da raccomandare! Grazie Valter e Patrizia! The Villa Barbalena is a wonderful place. The apartment is perfectly renovated and is very clean and comfortable. The large terrace is ideal to eat outside and relax. There is a nice garden and swimming pool and the owners are very kind. I can surely recommend this lovely place! Toscane is een echte ontdekking! De huiseigenaar doet er alles aan om het je naar de zin te maken. Je kan bij hem terecht voor alle info over de omgeving, shopping, bezienswaardigheden, resto's etc. Een echte aanrader! Ontzettend genoten van de prachtige accommodatie. Prive zwembad is ook een luxe zeker met deze afmetingen. Rust, ruimte en een hele mooie omgeving. Valter is aanwezig voor hulp, raad en het schoonhouden van het zwembad en tuin. Bedankt voor een mooie vakantie.